I've been looking for a dress like this forever and ever and ever and I finally found one at Primark, for 11€! I also bought a really cute partydress for 10€ at H&M today, it's pretty and dusty pink and draped and wonderful and the only one left was in my size! I'll show it to you soon. I also got a really cute dress from one of my readers, Petra, who owns a really cool shop called Restored (check out their webshop!) here in Amsterdam, where you can buy really cool clothes and things for your home, all made by independent designers. So lots of dress-happiness lately! I've been wanting a dress like that for so long, I never seem to find the perfect one! Very pretty and classy :) Loove your shoes, teehee! Never really pictured wearin stockin with these outfits, but you really bring out the great perfection!!!! Keep up the good posts. I love this dress! It is so pretty! I love your dress! What a steal of a deal you got! I post about you...love your style!!! Okay... I take that as a major compliment, because I am always astonished at what you put together. Haha if we could have a joint closet, that would just be fantastic! wonderful dress...and what a wonderful blog you have, I can't believe I haven't found it earlier! I fell in love with your dress. I love your dress(I may be slightly biased, as I am wearing a very similar one today...), these pictures are so pretty! Cute dress! I have those Topshop shoes too but yours have survived Winter a lot better than mine, ha. Looking forward to some independent clothes posts..
Aw, what a fun collar on that dress! Cuteness! Yay, Mars Volta! Your new dress is lovely. Great find. And in response to your comment ... yes, mentioning how much you saved is key! "How can I afford to NOT spend this $100 when I'm saving $500?!" lol. Gorgeous! I usually avoid Primark actually, but might make an exception for this! Where did you find your white tights? They seem to be impossible to find at the moment! Have fun with all of yr new dresses! This one looks very nice, makes me want to go to Primark. With me it's all about coats these days, thrifted and in the mail ^^. Prachtige outfit! Dat jurkje is echt geweldig mooi! I have almost the same dress, but my outfit is another ;) Greetings! Lucky you for finding such a beautiful dress soo cheap! :) Love the shoes!!!! It looks absolutely perfect, and the shoes are lovely. 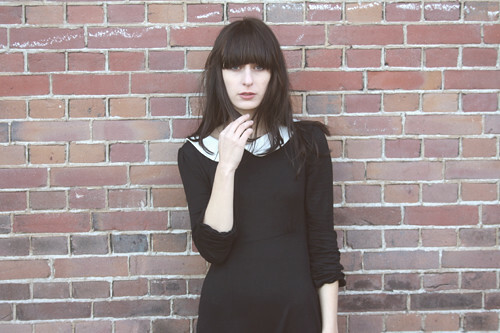 That peter pan collar dress is amazing!!! Love the photographs, the simple mood! I love that dress, I've been trying to find a similar one, but I guess I have enough peter pan collar stuff for now haha. This outfit is so so so chic. Love it. Your dress is so, so cute! peter pan collars are so adorable. i've just stumbled on your blog via chloe's, you've got great style. I love the simplicity of this outfit, you look fantastic! I found your darling blog from Chloe's blog-Dirt On Your New Shoes. You are absolutely adorable and I find your style very inspiring. Just wanted to let you know I'm a follower now. I adore your whole look ! De jurk staat je echt heel gaaf! Great look! I have a dress like this from H&M. And I just did an outfit post a while ago wearing it. The collar is my favorite part. Gorgeous dress, and so cheap! I may have to see if I can get hold of one. You cant go wrong with a peter pan collar. this is one of my favorite dresses you’ve worn of late. really adorable. I’m not a big fan of white tights but this came together well.